Just when I get cocky and start thinking that I know stuff, I am reminded again of just how clueless I am. Here are a couple of examples. First, track. We still don’t get it. On Wednesday, M ran a 3000 meter race–longer than she’d like, for sure–at her school track meet. We watched. She seemed to do well. There were a few girls from her school all running the same race. The girl who won is a very, very fast runner, a senior at our school. M came in second, not too far behind. So, we thought: great job! You ran almost as fast as the super-fast girl! You did so well! Ummm, wrong. M sort of sighed over how dense we were, then explained that the super-fast girl wasn’t even running her fastest. Instead, she was running at a more moderate pace so that the newer girls on the track team would learn how to pace themselves for the race. Not just that, M said, but she wasn’t even winded. She basically talked through the whole race, coaching her younger teammates through it. The whole goal was to help M and her teammates try to finish in under 11 minutes. Which they didn’t. So it was basically an all-around fail. Oh. Well, that’s too bad. Then today, M ran in two relays at a meet, a 4 x 800 meters and a 4 x 1500 meters. From what I could tell, she and her teammates ran fast. They came in first place in both races. Seemed to me like it all went pretty well. Nope. Apparently M’s time in the 1500 was so slow that she is full-on depressed about it. Honestly, on the track front, I think I’d prefer ignorance at this rate. Another example? Hair. J has been wearing two French braids frequently–I’d say, several times a week–for this entire school year. 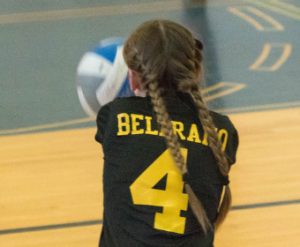 Two French braids are her go-to favorite hairstyle for volleyball and also for dressing up. Which is fine. They’re super-cute. Well, the other day, M asked me to give her two French braids since she was dressing up for school. I braided her hair, then drove her to school. We hadn’t even made it to the high school before she changed her mind and pulled the braids out. Which was pretty annoying. I dimly recalled this happening with M once before. But what the heck was the problem? “I just don’t like this style,” she explained. “That’s not the way you do it.” Huh? What style? I asked. And also: that is always the way I do it. It took a while, but eventually I understood that the way I generally do a French braid is wrong, wrong, wrong. I’d started with three substantial bits of hair, so the braid itself would begin just above the girls’ ears. 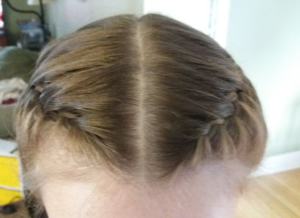 M wanted French braids like I’d seen her friend wearing them, which started with three teensy little strands very close to her hairline. I went back home and decided to practice the slightly different style on J. I could do it just fine, see? J agreed. She likes this style much better, actually. Um, hello?!? Couldn’t somebody please have just told me that? And damn, girls! They are just both so annoying in their own separate ways. M had seen J’s hair all this time, didn’t she notice the difference? She could have just asked, instead of letting me waste my time like that! She sounded like I always do it right but then screw up on hers. And, J! I’ve braided her hair a hundred times, at least, and yet it never occurred to her to ask if I could do it differently? Did she think I was incapable of braiding in this slightly different way? The whole thing left me feeling stupid, even though it’s totally not my fault. But, whatever. I’m not stupid. Just, you know, clueless.